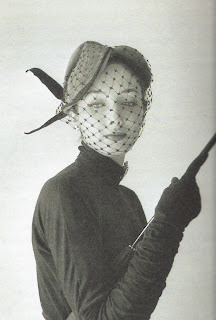 I mentioned the great allure of veils a few entries back, and am returning to the subject, mainly as an excuse to run this photo by Willy Maywald, illustrating a Jacques Fath hat from 1951. Exquisite, no? It’s also the perfect illustration of how a net veil should sit on the face, with the lovely angles at work in the net given full play against the curves of the face. Let’s backtrack a second, and talk about how a net veil should not sit on the face. This was made clear by a certain British A-lister who recently opted to wear a veiled hat to a photocall, and frankly, it let her down. (I won’t say who it was, because this isn’t that sort of blog, but if I did you wouldn’t be at all surprised). Anyway, her veil was bunched and matted and generally misbehaving. It looked vintage, in the worst sense, meaning old and crumpled. To look incredible, a veil needs to be arranged so that it sits in full but not overstretched extension, with no holes, snags, or ratty bits ruining the gorgeously graphic shadow it will cast. In other words, exactly like this.